Decal set for evinrude 4 hp 2 STROKE from 1976 from ITALY. 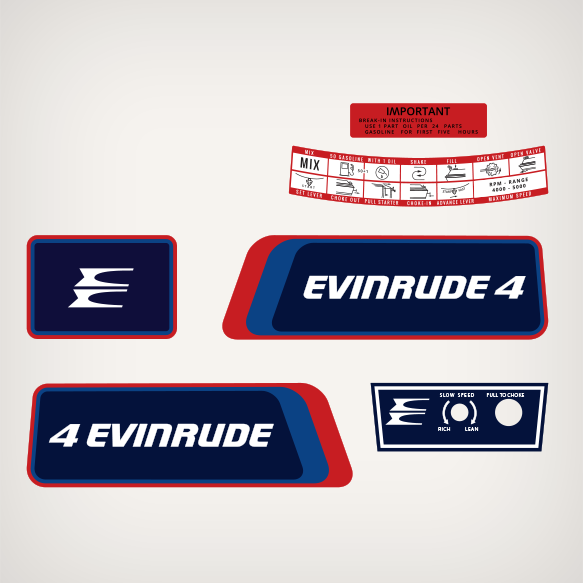 This decal set is also used on Evinrude 1976 4 hp. Reference 1976 Evinrude 4 hp decal set 46B36 belgium. Warning decal - Front Side. Starting instructions decal - Front Side. Evinrude E decal logo - Rear Side. Evinrude 4 hp decal - Port Side. 4 hp Evinrude decal - Starboard Side. EVINRUDE COVER DECALS: 0281320 STARTER HOUSING ASSY.